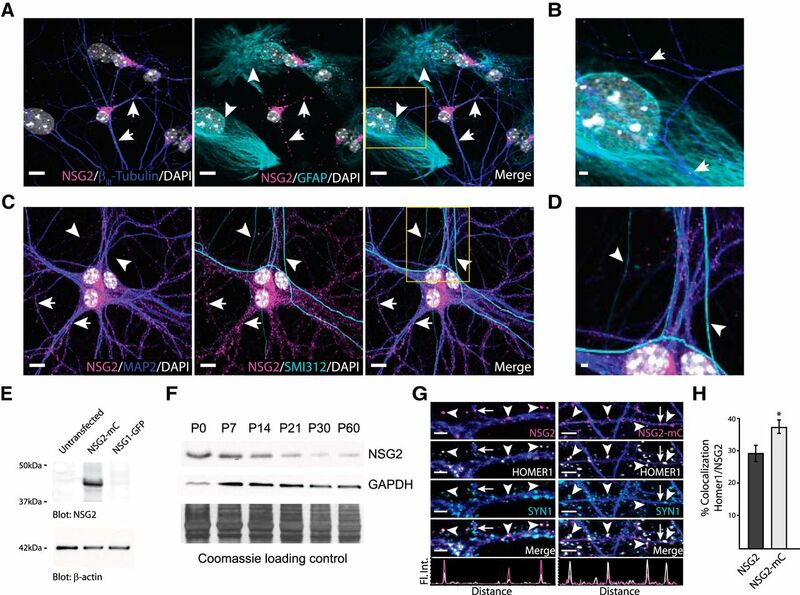 A subset of NSG2 punctae localize to PSDs of excitatory synapses. A, Representative confocal images of primary hippocampal neurons (DIV4) illustrate a perinuclear as well as punctate NSG2 expression pattern (magenta; arrows) in βIII-tubulin+ neurons (blue). No NSG2 expression was observed in GFAP+ astrocytes (cyan; arrowheads). The punctate expression pattern of NSG2 was found in all neurons tested up to DIV30 (Extended Data Fig. 1-1). B, Magnified image of yellow box in the merge panel of A. NSG2 puncta (magenta; arrows) are present only within βIII-tubulin+ neurons (blue). C, Immunofluorescent images illustrate NSG2 (magenta; arrows) punctae exclusively in MAP2+ (blue) dendrites and absence of NSG2 punctae in SMI312+ axons (cyan; arrowheads) at DIV14. D, Magnified image of yellow box in the merge panel of C. E, Representative Western blotting image demonstrating the specificity of the NSG2 antibody in detecting NSG2 (NSG2-mC; top panel, ∼48-kDa band; middle lane) but not the closely-related protein NSG1 (NSG1-GFP; top panel, ∼48 kDa). Bottom panel shows the β-actin loading control. F, Representative Western blotting image demonstrating the expression profile of NSG2 from mouse whole-brain lysate during development (top panel, ∼19-kDa band). While GAPDH was used as a loading control (middle panel), it shows variability across development. The blot was also stained with Coomassie (bottom panel) to demonstrate equal protein loading. G, Confocal images showing endogenous NSG2 (left panels) and overexpressed NSG2-mC (right panels) colocalized with HOMER1+ punctae (arrowheads; HOMER1 panel and merge). Endogenous NSG2 and NSG2-mC were frequently found adjacent to Synapsin1+ punctae (e.g., leftmost arrowheads). Individual panels for HOMER1+ (white) and SYN1+ (cyan) are shown for clarity. The colocalization profile of NSG2 or NSG2-mC (magenta trace) with HOMER1 (white trace) for the indicated punctae are indicated in the bottom panels. Some NSG2 punctae were not found colocalized to either HOMER1 or SYN1 punctae (arrow). H, Quantification of colocalization of Homer1 with either endogenous NSG2 or NSG2-mC. Bars represent mean ± SEM for n = 10 for each group; *p = 0.024. Scale bar = 10 μm (A, B), 2 μm (A, D, G; left panels), or 4 μm (G; right panels). NSG2 colocalizes with AMPAR subunits GluA1 and GluA2. A, B, Representative confocal images of primary hippocampal neurons at DIV15 showing perinuclear and punctate NSG2 (magenta) in MAP2+ (blue) neurites along with surface expressed GluA1 punctae (A, cyan), and GluA2 punctae (B, cyan). Separated color panels for individual markers from the boxed regions have been magnified for clarity (right panels). Lower right panels in A, B show the colocalization profile for NSG2 (magenta)/GluA1 (cyan, panel A) and NSG2 (magenta)/GluA2 (cyan, panel B) across the indicated punctae (arrowheads). C, D, Quantification of colocalization for NSG2 with surface GluA1 punctae (6423 NSG2 and 5392 GluA1 puncta from 10 neurons) and NSG2 with surface GluA2 punctae (6874 NSG2 and 5963 GluA2 puncta from nine neurons), respectively, from three independent cultures. Scale bars = 10 μm (A, B; left panels) and 2 μm (A, B; right panels). NSG2 interacts with AMPAR subunits GluA1 and GluA2. A, Co-IP of overexpressed, fluorophore-conjugated proteins. 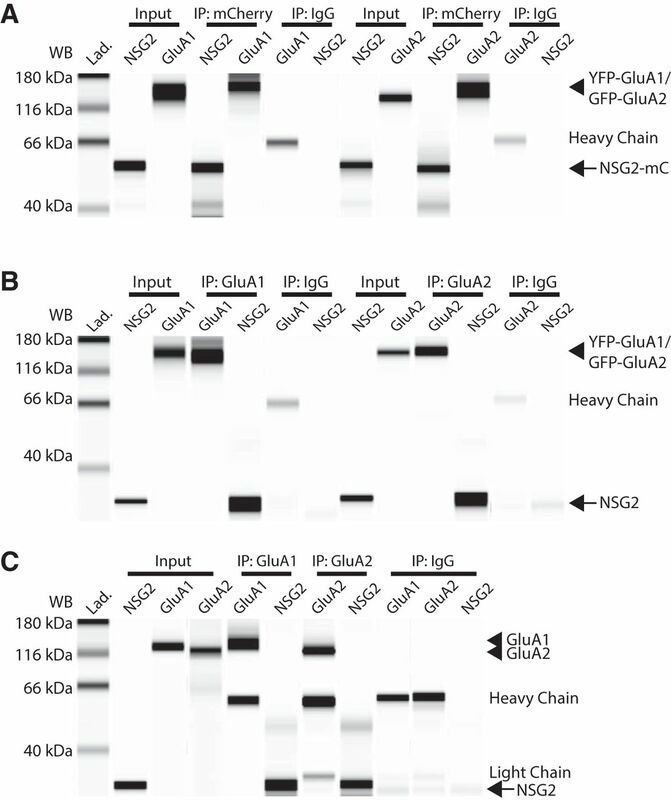 Representative digitized Western blottings from the automated Western blotting system (see Materials and Methods) showing that using the anti-RFP antibody to pull down NSG2-mC (IP: RFP, arrow) could Co-IP both YFP-GluA1 and GFP-GluA2 (IP: mCherry, arrowhead). A control IgG antibody did not IP nor detect any target proteins (IP: IgG); the heavy chain of mouse and anti-RFP was detected by the anti-mouse secondary antibody used to detect mouse anti-GluA1/2. NSG2-mC (arrow), YFP-GluA1, and GFP-GluA2 (arrowhead) were detected in the input (input). Traditional Western blotting techniques were performed to confirm that GluA2 co-immunoprecipitates with NSG2-mC (Extended Data Fig. 3-1). Samples were taken from HEK293T cells co-expressing NSG2-mC and either YFP-GluA1 or GFP-GluA2. B, Immunoprecipitation of overexpressed, unlabeled NSG2 with fluorophore-conjugated proteins with antibodies directed toward endogenous protein epitopes. Anti-GluA1 and anti-GluA2 antibodies immunoprecipitated YFP-GluA1 and GFP-GluA2, respectively (IP: GluA1 and IP: GluA2, arrowhead). Unlabeled NSG2 (arrow) coexpressed in HEK293T cells was also detected using these same conditions, confirming the Co-IP; control IgG did not IP nor detect any target proteins (IP: IgG). NSG2, YFP-GluA1, and GFP-GluA2 are detected in the input (input; GluA1; GluA2, arrowhead; NSG2, arrow). Lower bands in NSG2 lanes of control IgG pull down conditions is thought to be non-specific is found in all similar reaction conditions and migrates faster than NSG2. C, Immunoprecipitation from in vivo samples (whole-brain lysate of P0 mouse). Anti-GluA1 and anti-GluA2 antibodies immunoprecipitated endogenous GluA1 and GluA2 (IP: GluA1 and IP: GluA2, arrowhead) as well as endogenous NSG2 (arrow). All target proteins were detected in the input lanes (input; GluA1 and GluA2, arrowhead; NSG2, arrow). Control mouse IgG antibody did not pull down GluA1, GluA2, or NSG2 (IP: IgG). As expected, heavy chain and light chains from antibodies used for pull down were detected in most Co-IP conditions (all IP lanes). Knock-out of NSG2 decreases mEPSC frequency. A, Representative confocal images of primary hippocampal neurons at DIV15 showing robust NSG2 (magenta) in MAP2 + (blue) neurons transduced with control CRISPR GFP lentivirus (cyan; top panels), whereas neurons transduced with CRISPR KO NSG2 lentivirus (cyan, bottom panels) show the absence of NSG2 (arrow; bottom panels); NSG2 (magenta) is present in an adjacent neuron not transduced with the CRISPR KO NSG2 lentivirus in the same field (arrowhead; bottom panels). B, Representative traces from whole-cell patch clamp recordings from neurons expressing either control CRISPR GFP (upper trace, black) or CRISPR KO NSG2 (bottom trace, green). Averaged mEPSCs from both control (black, n = 10) and NSG2 KO (green, n = 13) are shown to the right. 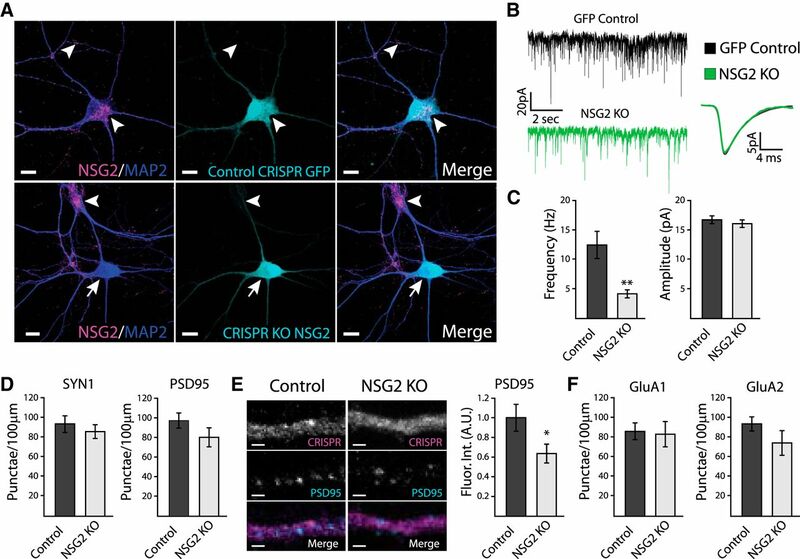 C, Pooled data revealed a significant decrease in mEPSC frequency in neurons expressing NSG2 KO compared to cells expressing control CRISPR GFP (**p = 0.001). The amplitude of mEPSCs was not significantly different between groups (p = 0.34). Data in the KO group were derived only from neurons devoid of NSG2 confirmed by post-recording immunostaining of Lucifer yellow injected neurons (Extended Data Fig. 4-1). NSG2 KO did not alter outward potassium I/V relationship (Extended Data Fig. 4-2). D, Quantification of presynaptic marker Synapsin1+ punctae (control, n = 10; NSG2 KO, n = 10; p = 0.46) and postsynaptic marker PSD95+ punctae (control, n = 9; NSG2 KO, n = 11; p = 0.18). E, Representative confocal images illustrate PSD95 immunofluorescence (cyan) in neurons expressing CRISPR KO NSG2 (right panels) or controls CRISPR GFP (left panels). GFP expression from both groups (top panels) is presented in grayscale for clarity. Quantification revealed a significant reduction in PSD95 fluorescence intensity in neurons expressing NSG2 KO (n = 11) compared to controls (n = 9; *p = 0.029). F, Pooled data show that the number of surface GluA1+ punctae (left; control, n = 10 and NSG2 KO, n = 9; p = 0.86) and surface GluA2+ punctae (right; control, n = 10 and NSG2 KO, n = 9; p = 0.18) remained unchanged between groups. Bars represent mean ± SEM. Scale bars = 10 μm (A) and 1 μm (E). Overexpression of NSG2 increases mEPSC amplitude. A, Representative traces from whole-cell patch clamp recordings from neurons expressing either mCherry alone (upper trace, black) or NSG2-mC (bottom trace, red). Averaged mEPSCs from both control (black, n = 11) and NSG2-mC (red, n = 10) are shown to the right. B, Pooled data illustrate that neurons expressing NSG2-mC showed a significant increase in mEPSC amplitude compared to controls (**p = 0.01), whereas the frequency of mEPSCs was not different between groups (p = 0.35). C, Neither GluA1+ punctae number (p = 0.58) nor relative fluorescence intensity (p = 0.36) were significantly different between groups (mCherry vs NSG2-mC). D, Representative confocal images showing neurons expressing either mCherry alone (left panels) or NSG2-mC (right panels) stained for MAP2 (magenta) and surface GluA2 (cyan). Individual GluA2 and MAP2 expression from both groups (top two panels) are presented in grayscale for clarity. 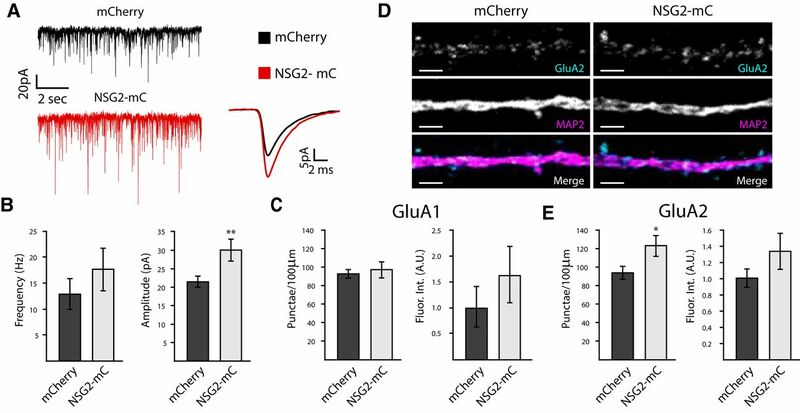 E, Pooled data revealed the number of GluA2+ punctae was significantly increased in neurons expressing NSG2-mC (n = 10) compared to controls (n = 10; *p = 0.02), while relative fluorescence tntensity remained unchanged (p = 0.19). Bars represent mean ± SEM; A.U., arbitrary units. Scale bars = 2 µm. NSG2 is robustly expressed in hPSNs. A, Representative confocal immunofluorescence images of day 30 hPSNs showing the expression and distribution of NSG2 (magenta; arrows) in βIII-tubulin + neurons (cyan). DAPI + nuclei are indicated in white. B, Representative confocal images of day 50 hPSNs showing the expression and distribution of NSG2 (magenta; arrows) in βIII-tubulin + neurons (cyan). DAPI + nuclei are indicated in white. C, Representative confocal images of hPSNs illustrate NSG2 (magenta; arrows) expression restricted to MAP2 + (blue) neurons and absent from Pax6 + neural progenitors in day 30 hPSN cultures. Nuclear Pax6 + (cyan; arrowheads) colocalized with DAPI + nuclei (white; arrowheads). Scale bars = 10 μm. Download Figure 1-1, EPS file. NSG2 remains expressed in mouse hippocampal neurons at DIV30. Representative confocal immunofluorescence images of primary hippocampal neurons (DIV30) showing the expression and distribution of NSG2 (magenta; arrow) in βIII-tubulin + neurons (cyan). DAPI + nuclei are indicated in white. Scale bars = 5 μm. Download Figure 1-2, EPS file. NSG2 expression in hPSNs is neuron-specific and somatodendritic. A, Representative confocal images of hPSNs illustrate NSG2 expression is perinuclear (magenta; arrows) and localized to punctae distributed in MAP2 + (blue) dendrites; NSG2 punctae are absent in GFAP + astrocytic processes (cyan; arrowheads) at day 50. Far right panel shows magnified image of yellow box in merge. B, Representative confocal images of hPSNs illustrate NSG2 punctae (magenta; arrows) exclusively in MAP2 + (blue) dendrites but absent from SMI312 + axons (cyan; arrowheads) at day 50. Far right panel shows magnified image of yellow box in merge. DAPI + nuclei are indicated in white. Scale bars = 10 μm. Download Figure 1-3, EPS file. NSG2 colocalizes with AMPAR subunits GluA1 in hPSNs. Representative confocal images of hPSNs at day 50 overexpressing NSG2-mC showing perinuclear and punctate NSG2 (magenta) in MAP2+ (blue) dendrites along with surface expressed GluA1 punctae (cyan). Separate magnified panels for each marker indicated by the boxed region are provided for clarity (right panels). Colocalized NSG2 punctae (magenta) and surface GluA1 (cyan) are indicated by arrows while non-colocalized proteins are indicated by arrowheads. Scale bars = 10 μm (left panel) and 2 μm (right panels). Download Figure 2-1, EPS file. 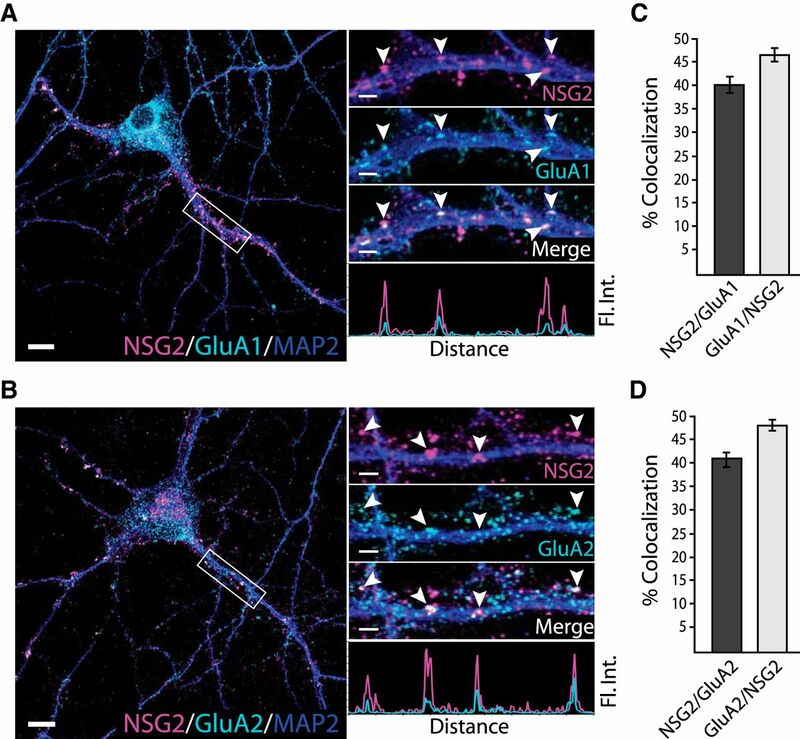 NSG2 and GluA2 physically interact. Representative Western blotting image showing Co-IP of NSG2-mC and GluA2 by anti-RFP in lysates from HEK293T cells co-expressing both proteins (Co-IP RFP Trap; NSG2-mC, red bands; GFP-GluA2, green bands). The specificity of antibodies is confirmed by the absence of bands in lysates from untransfected cells (untransfected) and presence of bands of expected size in the input lane (input-coexpression lysate). Anti-RFP was unable to Co-IP NSG2-mC GluA2 when the two proteins were overexpressed in different HEK293T cultures, and lysates were incubated together and then subject to immunoprecipitation (in vitro incubation). Download Figure 3-1, EPS file. Lucifer yellow injections used to verify NSG2 KO in recorded neurons. Representative confocal images of primary hippocampal neurons (DIV15) showing the absence of NSG2 (magenta, arrow) in MAP2 + neurons (blue) transduced with CRISPR KO-NSG2 lentivirus (cyan). Lucifer Yellow was injected into neurons expressing CRISPR KO-NSG2 during whole-cell patch clamp experiments (inset: Luc; yellow; Fig. 4). NSG2 (magenta) was present in MAP2 + neurons not expressing CRISPR KO-NSG2 (arrowhead). Scale bars = 10 μm. Download Figure 4-1, EPS file. Alterations in NSG2 levels does not affect voltage-gated potassium currents. A, B, Current-voltage relationship plots illustrating that neither NSG2-KO (A, open circles) nor NSG2-mC overexpression (B, open circles) caused a significant change to transient potassium current elicited by voltage steps compared to controls (A, B, black squares). C, D, Representative traces from plots in panels A, B in response to voltage steps from –50 to +50 mV (step size, 10 mV). Download Figure 4-2, EPS file. Knock-out of NSG2 does not alter NSG1 levels. A, Representative confocal images of primary hippocampal neurons (DIV15) showing the presence of NSG1 (white, arrowhead) in MAP2 + (blue) neurons from GFP + cells transduced with either CRISPR control (cyan; top panels) or CRISPR KO-NSG2 lentivirus (cyan; bottom panels). Middle panels illustrate the presence of NSG2 (magenta, arrow) in MAP2 + neurons (blue) transduced with CRISPR control (top panels) and absence of NSG2 (arrow) in MAP2 + neurons (blue) transduced with CRISPR KO-NSG2 lentivirus (cyan). Scale bars = 10 μm. B, Pooled data show that the density of NSG1 punctae remained unchanged between groups (bars represent mean ± SEM, n = 10 per group; p = 0.97). C, Representative agarose gel showing digested fragments from mouse NSG2 DNA amplicon (arrow) were observed in cells that received either gRNA#1 or gRNA#2 + T7, but not in control or without T7. Download Figure 4-3, EPS file.